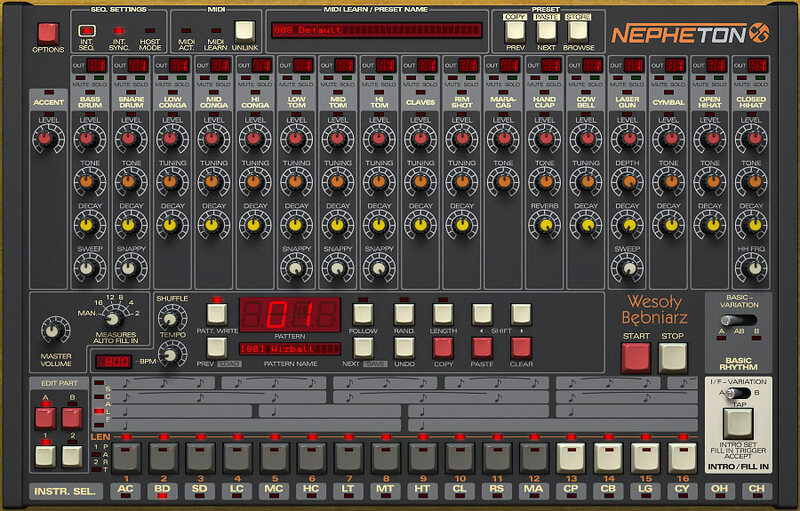 Nepheton is an emulation of the classic Roland TR-808 drum machine taking its sound a step further with all the original functions and many additional features. Enhanced control of instruments' sounds. Mute/solo for each instrument (affect triggering not just the signal). Fully controllable via MIDI CC. Quick MIDI CC assignation with MIDI Learn function. User defined MIDI map (default set equal to General MIDI). MIDI tune and velocity controls instruments' levels and tunes. 16 patterns (12 basic rhythms and 4 intros/fill ins. Pattern contains up to 4 segments (up to 16 steps per segment). Each segment can be defined with one of four available measures. Each step can be defined normal or accented. Shuffle defined per pattern part. Scale function and intelligent Rescale (automatically stretches pattern to the chosen measure). Built in Randomizer (selection of instruments to random, steps to be affected, frequency of the randomized notes and more). Synchronization to internal clock - tempo controlled in the range 30-303 BPM (+-0.1).